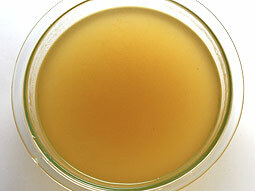 Flavorful and aromatic Vegetable Stock, a great alternative to chicken stock, is easy to prepare at home. This recipe uses parsley, garlic and bay leaf along with various cut vegetables like cabbage, carrot, tomato, celery, onion, etc. 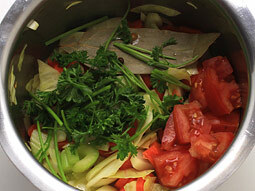 to make aromatic and appetizing stock. Take all the vegetables mentioned in the ingredient section. You can also add the mushrooms, green beans etc. Heat oil in a heavy based pan. 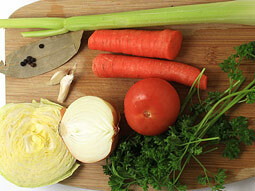 Add all chopped vegetables (carrot, onion, garlic, cabbage and celery) except tomato. Cook until all veggies turn little soft, for approx. 3-5 minutes. Add tomato, black peppercorns and bay leaf. Add 4-5 cups water and bring the mixture to a boil over medium flame. 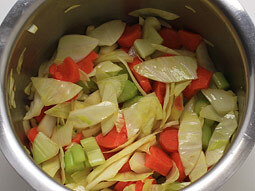 When it comes to a boil, reduce flame to low and simmer for around 40-45 minutes. Turn off the flame. 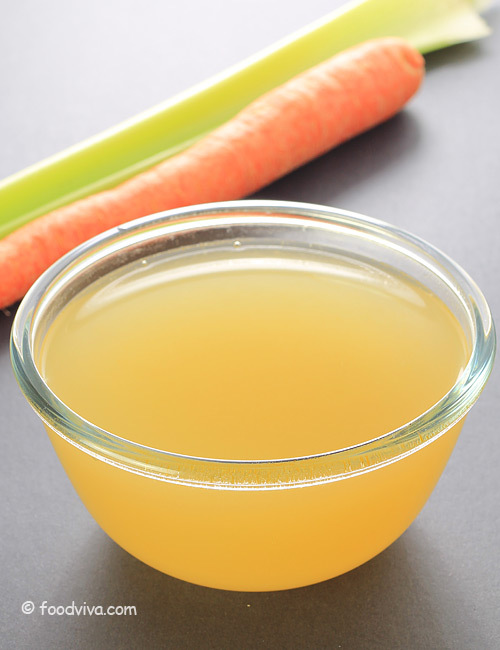 Pour the stock through a large strainer into a large bowl. Discard vegetables and spices. You can use the discarded veggies to prepare gravy for your curry. 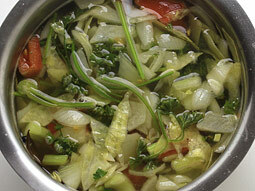 Vegetable stock is ready. When it cools down completely, store in the refrigerator. It stays good for a week in refrigerator and for upto a month in freezer. 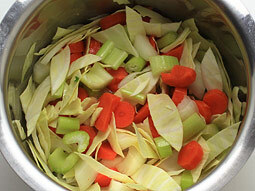 If you cook vegetables for more than an hour they will lose their flavor. Simmer at medium temperature for best flavors to come out. 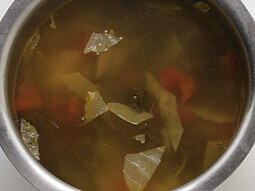 Too high or too less temperature will result in less flavorsome stock. 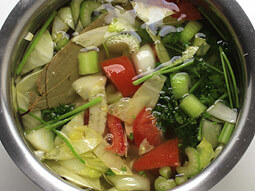 If you want to prepare vegetable soup stock, then do not add spices. Taste: Mild aroma of spices and veggies. 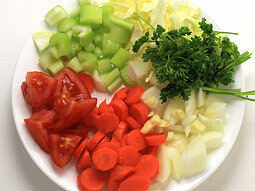 Serving Ideas: It can be used to make soup, curry and many other food dishes. 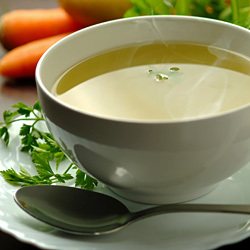 Thick marinated vegetable stock can be used as soup itself. Very very interesting and helpful.